Many past trends have seen the light in the French capital whether on the catwalks, a store or between the white walls of some obscure art gallery. Living in the heart of Paris Ferry Schoew keeps a close eye on every little change in the cultural landscape of his favorite city. They might be the first sign of a major new trend in the make! Each month Trendformation® highlights one Parisian trend alert, handpicked by Ferry Schoew and described by Rebecca Voight who's also a Style editor for the Herald Tribune. Topics range from the newest boutiques and the hottest restarants to the latest young talents on the fashion catwalks. 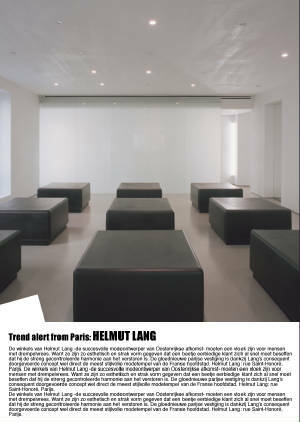 Trendformation®'s Paris trend alerts are conceived as a double spread or single page with an inspiring visual to illustrate each topic. 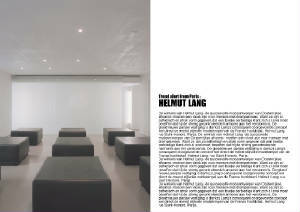 Trendformation® provides its subscribers with the high-resolution image of each topic and a text in English. There are 12 Paris trend alerts a year that are sold as a six months subscription (= 6 files). A subscription costs 3000 Euro (= 500 Euro for each file).